My Village Living teammate was Liz, an awesome gal from Australia! I thank God for putting us together for these five weeks in the village as we both have fairly laid back personalities, and enjoy spending time with people. She was also a good encouragement to me spiritually, and just a good all-round friend. 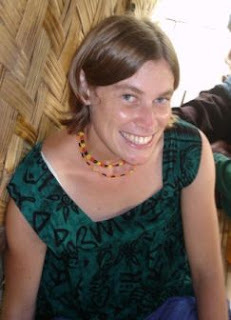 She has come to PNG for two years in a graduate program. She would like to help out in the area of literacy, working with experienced literacy workers. Often a literacy specialist will work concurrently with translators in a language group, teaching people to read, while at the same time the translators help to translate the Bible into the mother tongue ~ after all, a Bible is just a paper weight if you don’t know how to read it.